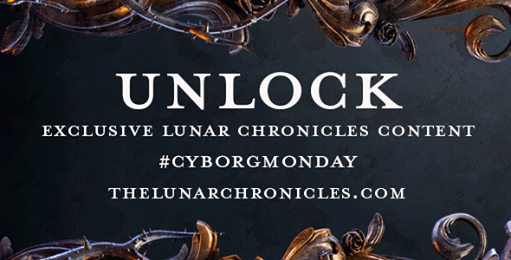 Forget Cyber Monday, we’re having our own cyber party all day today—officially dubbed Cyborg Monday—as we unlock exclusive new Lunar Chronicles content and start preparing ourselves for the upcoming release of Fairest on January 27! 4. Enter the Cyborg Monday Sweepstakes on Instagram. 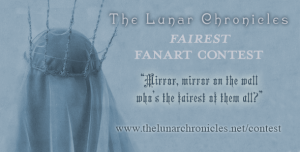 You could win a copy of Fairest plus a Fairest poster and mirror! Want to read the first chapter of Fairest? Listen to a video of me reading an excerpt from the book? 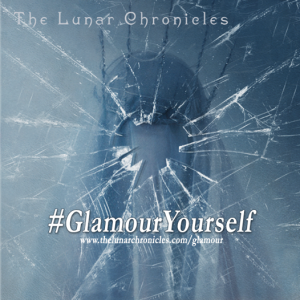 Download Lunar Chronicles wallpapers? See what cities I’ll be traveling to for the Fairest tour next January? Then it’s up to you to help us unlock all this content! All of those tweets, shares, follows, and reblogs are currently being monitored by Cress, and when we reach certain milestones, content will be unlocked! So get busy! 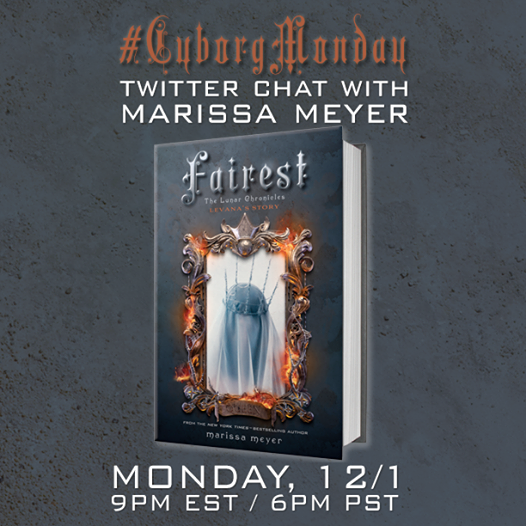 Bring your questions and excitement to the #CyborgMonday Twitter chat, happening tonight at 9:00EST/6:00PST. 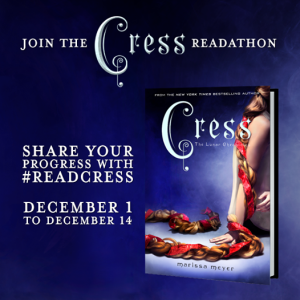 Read and share your thoughts on Cress between now and December 14! More details can be found here. I don’t like this unlocking stuff. It’s just a sneaky way to advertise your books. I can understand that perspective. Personally, I think it’s neat way to get the fans involved with building the buzz for the next book. This unlocking is fun, yes, but it’s limited to those who have all these social media accounts. Those who don’t have them – trying to stay away from the procrastination – won’t be able to get these goodies. Even if we’re Lunar Chronicles fans. Sadly, that is true :(. But once something is unlocked, everyone should have access to it! You just have to go to thelunarchronicles.com and view or download whichever of the goodies you want. Like right now we have the first page of Fairest available and a downloadable wallpaper. Enjoy! Okay. Sorry for little freak out. Carry on. Will there be any Winter material releases anytime soon?! you haven’t posted since last year!! I just wanted to ask you what would be covered in the book without any spoilers. Thank you! I’m glad to find this article. Hope to see more updates from you. The article you shared here is great. I really like and appreciate your work. The points you mentioned in this article are helpful. I have to try to follow these points and also share others. thank you.